Breakfast with monkeys, backpack with itinerary left behind, one gate at the airport. Now we’re caught up. Our flight to New Delhi is super short, less than an hour. We have been here once, stayed in a hotel that looked promising but left a little to be desired. We’re going back to the same hotel, renting a single room to drop our overstuffed, overweight luggage and consolidating what we can into an overnight bag for Agra. Our afternoon will take us on a brief bus ride through a small part of New Delhi. This city was not on my top-ten-places-to-visit-in-India list, but I’m open to seeing it from the air-conditioned comfort of a bus. I am pleasantly surprised. The area we are traveling through is very clean with manicured medians and shade trees lining either side of the busy thoroughfare. It feels like a city. The roads are in good shape, even the sidewalks look walkable. I’d definitely take time to explore if I could. We pass the Red Fort, it had been on our list to visit, but our time has been compressed so we’re left with a drive by. 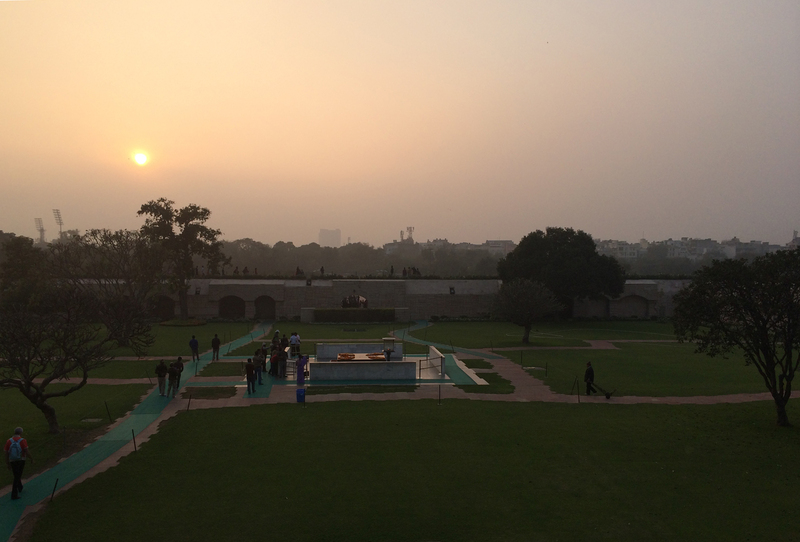 We head to the cremation site of Gandhi – Raj Ghat. It is a big wide open park and we are warned that security is tight because the terrorist threat is high-ish. After living and flying in a post 911 America we’re used to code: Orange for terrorist threat, this feels about the same. We’re willing to take our chances. 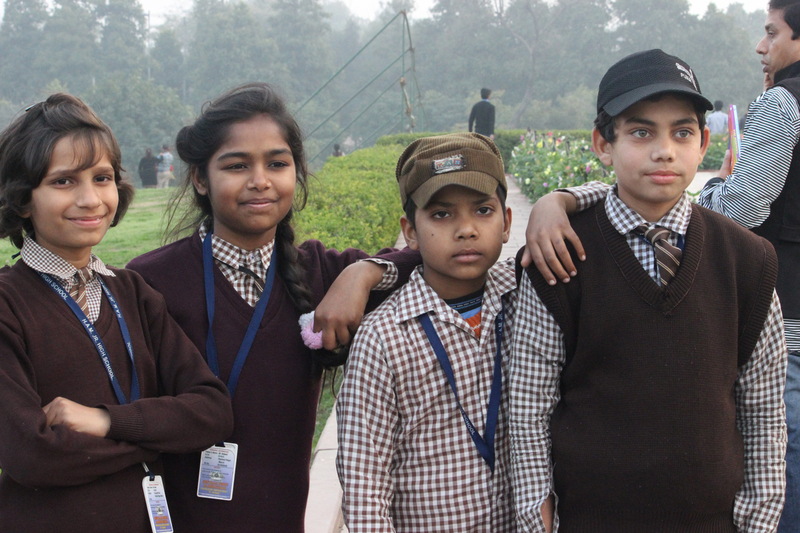 Every school in New Delhi has chosen today for a field trip. There are clumps of uniformed children in all ages and sizes all over the park. While they are here to show their respects to the great man for whom this park is erected and perhaps learn a little bit of their country’s history, we, the pale foreigners, have become the attraction. “Miss, can we have picture with you?” The tall, fair, and female get picked off first. In the interest of fairness, we take their pictures as well. 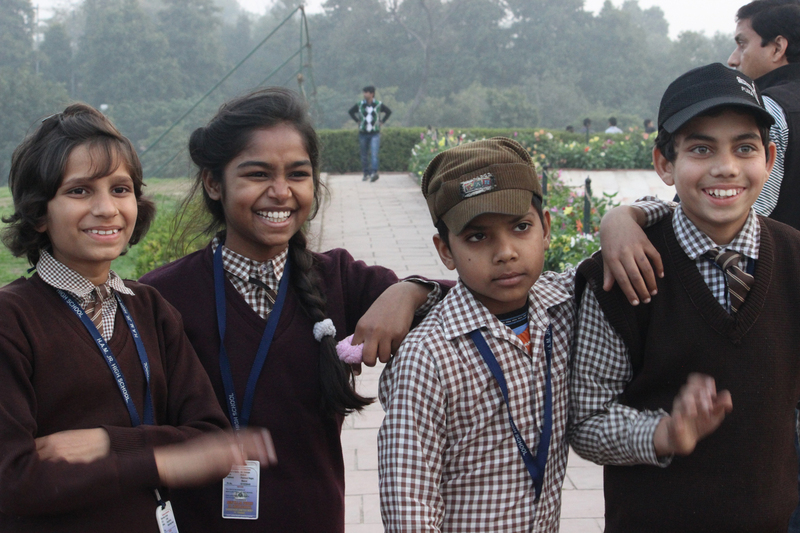 The kids love having their photos taken, they go all Bollywood poster on us. The boys look humorless, serious even, chin down, arms crossed. The girls wear a mysterious Mona Lisa smiles. Then the moment after the photo has been taken the huge, bright smiles return, lighting up their faces and that’s the photo I try to take. The actual monument is an elevated giant square of marble covered in flowers with an eternal flame burning at one end and a bench at the other. A wide marble walkway surrounds it. Beyond that, an even wider manicured lawn. The area around the lawn is built up, as if the monument itself is in a big square bowl. On the upper level the walkway is made of stones and bordered with flowers. Rolling hills slope down on all sides. It’s here that we first gather. Swami Divyananda, is leading us around the perimeter above the monument chanting Om shanti – peace – Gandhi’s honorable mission. We’re almost hushed in our chant, internalizing the vibration and meaning of the words. No one watches, no one cares – or rather no one minds. Devotion and chanting are the norm here. After paying homage as a group a few of us head down the hill to the tomb. Although it is not really a tomb, Gandhi’s ashes have actually traveled quite a bit and what was thought to be the last of them, were mixed with water and poured into the Arabian sea by his great-granddaughter a few years ago. This place is simply a monument to his existence and contribution to independent India, and the world. Our individual respects paid, we begin to meander back toward the bus. Our next stop is the train station so most of us decide on a preemptive bathroom break. In the distance just past our bus is a white structure with two doors, a woman stands in front of one and a man in a chair at a table sits off to one side. My pace begins to slow as I eye them suspiciously. Do they work here? Are they charging for the bathroom?! I walk with purpose toward the ladies room. The woman in front stops me and tells me (in words I don’t understand but hand gestures and tone of voice I do) that I must see the man at the table. With the cash box. I turn, sure to convey my contempt, and march toward the table. I have fully embodied my Ugly American. I ask, “How much?” His reply, “10 rupees.” I look at him as if he just told me the moon is a sponge not much bigger than a beach ball. I slap down my 10 rupee note and push past the evil bathroom monitor in front of the ladies room door. Inside is stinky and not too clean. Every stall is Indian style. I have just paid 16 cents to squat over a dirty hole in the floor when I didn’t even have to go. Six. Teen. Cents. This is my battle? I wash my hands and leave – a trail of angry energy behind me. Once on the bus, I let it go. I am ridiculous. Done. As we approach the train station an air of apprehension begins to rise on the bus. Two red coated porters spot the giant “TOURIST” scrawled on the windshield and give chase alongside us. Once the bus pulls away we are left naked, unprotected, holding onto our precious bags as if filled with diamonds and puppies. The porters see we’re mostly capable of handling our own overnight bags and after a few minutes they leave. Our shoulders collectively drop. We’re professionals now. We’re not rushed. We know we’ll find our train and our car at some point. And we also know time is on our side, surely the train will be late. At the platform in front of the empty tracks I begin to notice movement. Rats. Not the raccoon sized ones in NYC, these guys don’t eat that well, smaller more manageable, dare I say cute, rats. They scurry in and out of holes, under the tracks searching for edible morsels. They hold my attention and entertain me while we wait an additional 30 minutes for our late train. Once it pulls into the station we find our car and board. Unlike our first train ride, in airplane style seats, this time we will be in a sleeper car. I conjure first the glamour of an early 1900’s train ride, complete with red velvet curtains, hollow train whistles and mystery. Then I recall the chaotic, colorful, overcrowded depiction of train travel in India in Darjeeling Limited. What I am faced with is much more pedestrian and mundane. The car is fitted with red vinyl bench seats that face each other. Each sits three. Above each seat is a bed suspended from the ceiling. We are leaning against a red vinyl pad that is the middle bed once lifted and hooked into an industrial sized waiting chain. There are heavy maroon curtains that can be drawn to block out the light or for privacy. The upper bunks still hold the soiled linens of the previous passengers. After a short discussion on lice and other scourge that lurk in the dark recesses of a less than sanitized place, one of us is brave enough, or tired enough, to take on the sanitization of the upper bunks. Old sheets and pillows are tossed aside, surfaces are scrubbed and new linens are procured. The beds are ready for sleeping. Of the six of us, two have disappeared to chat with friends in other berths, two have climbed up to rest and two, of which I am one, are leaning against the train wall with our legs outstretched on the lower bunk. The gentle jostling motion of the train begins to rearrange our cells inducing a light, yet relaxing sleep. We arrive in Agra sometime after 10, find our bus and head to the Taj Resort, our hotel for the evening. Hungover with sleep and travel weary we half-hear that we are to be in the lobby, breakfast eaten and ready to go at 7 am tomorrow. We’re determined to be among the first of the 20,000 guests the Taj Mahal hosts each day. But we’ll think about all that tomorrow, for tonight, we sleep.